Home » 2011 Minutes » Spartan Speedway Welcomes MARFC for 2011! Spartan Speedway Welcomes MARFC for 2011! 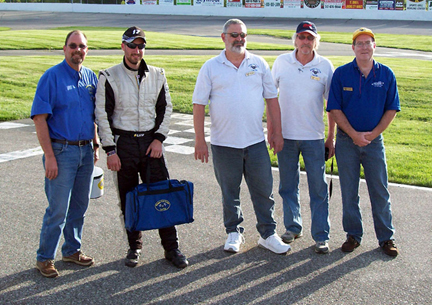 The club head to Spartan Speedway where the MARFC Helmet Bag was presented to Chris Hettinger by our P.R. Director, Rand Thompson. 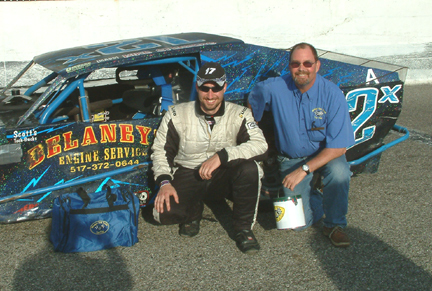 Chris races in three different divisions at the speedway and along with his family have been longtime supporters of Auto Racing not only at Spartan but all over the state of Michigan and the Midwest. Our raffle prize went to Doug Jakeaway who also had assisted Dennis Schalm, Chuck Horan, Dennis Trinklien, and Rand Thompson at the membership table. Previous post MARFC at Dixie Motor Speedway! Next post MARFC attends NAARFC Convention for 2011!